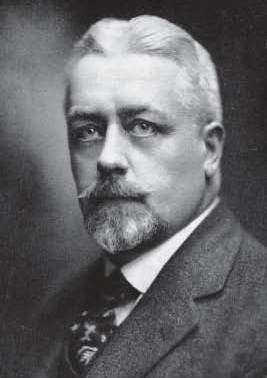 Arvid Reuterdahl, born February 15 1876 in Rans?ter parish in V?rmland County, died in 1933 , was a Swedish-American engineer and bridge designer. He was also the founder of the Academy of Nations, an association of "new science" (New Science) based on the whole, as opposed to the increasing specialization and abstraction which include Albert Einstein's relativity accounted for. Arvid Reutderdahls parents were Swedish farmers and emigrated in 1882 to Providence, Rhode Island on the East Coast. Arvid received thus their entire schooling in the U.S. and studied 1893-1897 at Brown University with a degree in engineering as Bachelor of Science degree. He continued to teach mathematics and physics at Brown and at the Technical High School in Providence. He took the 1899 Master of Arts degree, married 1902 to Elinor Louise Morrison and was from 1904 to 1905 professor of physics at Colby College in Waterville, Maine. He developed an electric battery and founded Reuterdahl Electric Co to exploit the invention. He then worked for City Planning in Spokane, Washington and was a 1908-1910 Head of the brobyggnadsavdelning. In Boise , Idaho, 1913-1918, he was consulting engineer. At the Kansas City Polytechnic Institute (founded in 1915, changed its name in 1919 to the Junior College of Kansas City, since 1964, Metropolitan Community College) from 1915 to 1917 he was professor of theoretical and applied mechanics. He then moved to St. Paul, Minnesota and was the 1918-1922 dean of engineering and architecture faculty at St. Thomas College (sedan 1991 University of St. Thomas). Thomas College (since 1991 the University of St. Thomas). Together with Robert T. Browne, he founded in 1921 Academy of Nations (AON) and was the American Secretary General. European representative was Ernst Gehrcke in Berlin, who in 1922 founded the German section, together with Hermann Fricke, John Riem, Leonore Ripken-Kuehn and John Glaser. To the supporters of Sweden heard Stone Lothigius and retired mechanics professor OE Westin. A Yugoslavian department was founded by Stjepan Mohorovi?ic. Aon took as its task to counter the increasing specialization of science, and would instead aim for synthesis and context. Science would be illustrated and understood with common sense. Conflicts between disciplines was not accepted, but would be matched by a world tribunal. The name alludes probably the League of Nations ( League of Nations ), based 1920th Aon has been described as an association of Einstein-opponent. Of the founding manifesto's text devoted half its criticism of the theory of relativity. In addition to cause fragmentation, Einstein was accused of plagiarism. Reuterdahl had himself been working on a theory of space-time, which did not depend on the concept of ether. The German chapter of the AON would have dissolved in the mid-1920s, while the U.S. probably survived at least to 1930. Einstein-criticism was also an anti-Semitic bias. Reuterdahl received support from bilmagnaten Henry Ford, and edited the 1921-1925 science column, "International Science Briefs" in the Journal of Ford's The Dearborn Independent , in which Ford's anti-Semitic essay, "The International Jew" was published. Reuterdahl left his post at St. Thomas 1922 to found the Ramsey Institute of Technology, whose president he was up to 1926. He continued as editor of theistic Monthly, a magazine which linked together science and religion. He founded the "Inter-Church Alliance theistic" and "Theistic International Society". For the World Fair in Chicago in 1933, he planned a "Temple of God of Science". He was a member of many scientific societies and Freemasons.